In 1917 Wylie Camp, a temporary tent lodging was setup in the canyon. At this time the area was called Mukuntuweap. A year later, in 1918, it was renamed Zion National Monument and another year later, in 1919 it was given the name it has today: Zion National Park. In 1921 ideas and projects came into play to connect the canyon via a narrow road to the east side of the park. In 1925 46 cabins were built in Zion Canyon. 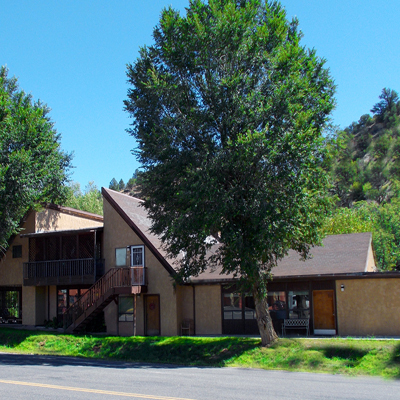 Fern Morrison bought two of those cabins when the park sold them and built them into her home, which today is known as the East Zion Riverside Lodge in Mount Carmel Jct. By 1930 the tunnel and road were completed from Zion's south entrance, through the east entrance to Mt. Carmel Jct. Fern lived through World War I and two of her children drowning in the Virgin River behind where the cabins sit today. She worked hard to develop the land she and her husband Jack homesteaded. She was one of those ladies that saved just about everything due to living though such hard times. She was in her 90's when she died and up to that day while she still owned and operated the Thunderbird. She survived the hardships of the past but never gave up her simple ways. Her home shows this in many ways as she pieced together parts of her past including the tiny home she gave birth to her children in, to make the house she lived in her last 20 years of life. For most of her life, she lived in the small basement under the restaurant which is where she raised her two children that are still living today.